Its just in recent times when FIFA and other leagues started collecting physical statistical data of players around the world. 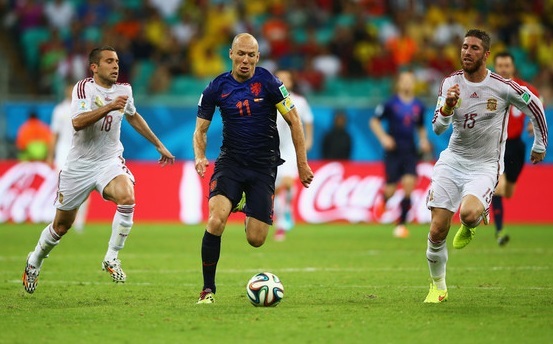 FIFA conducted a survey during 2014 World Cup in Brazil where they monitored players pace throughout the competition and it was revealed that Arjan Robben cloaked around 37kmh during the group game against Spain. That is widely regarded as the fastest speed record of a footballer since such data collection started. Now players speed and performance is often monitored in top european leagues and below is the list top 15 fastest footballers around the world according to official sources such as FIFA, PremierLeague and Opta. Arjan Robben tore Spain’s defense apart during 2014 world cup group game where Holland beat Spain by 5-1, he reached top speed of 37 kilometer per hour when he sprint pass Ramos and Jordi Alba to score his second and Holland’s fifth of the day. It is regarded as the fastest sprint recorded by a footballer player since FIFA and other competitions started recording such physical statistics. Southampton’s Shane Long hit the 35.3 km/h mark in the premier league game highest in England. Australian born Mathew Leckie also made the headlines in Germany when Opta revealed his sprint (35.18kmh) against Stuttgart to be fastest ever recorded in Bundesliga. In Spain just recently La Liga and Opta started collecting such data so not much info is available there but according to “Marca” Gareth Bale’s run against Barcelona in Copa Del Rey final was cloaked at 34.9 km/h. Olympic gold medalist and sprint champion Usain Bolt can cloak upto 44.64 km/h at his peak. The numbers and following tables are official statistics from FIFA, Premier League and La Liga. No other major competition or league reveal such statistics. Premier League stats provided by “OPTA”. 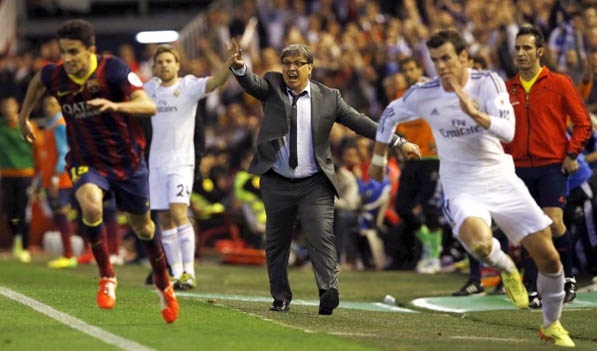 According to player physical performance statistics in La Liga published by “Marca” Gareth Bale’s 34.7 km/h top speed during that famous sprint against Barcelona resulted in goal was the fastest recorded by any player in Spain. Ronaldo may br little slow than others but his legs work like thunder spark!!! ur a fool man,to say that!!!. That is wrong, the fifa does not mark the maximum speed reached in a race, they mark average speeds, in addition the statistic of 34.7 km / h of gareth bale was dictated by the own site of fifa.com in 2013, therefore it is impossible Having managed to reach 34.7 km / h in the Copa del Rey since it only happened in 2014. Besides that fact, Gareth Bale reached 34.7 km / h of average speed, you can not mix average speed data with maximum speed . Isso esta errado, a fifa não marca velocidade máxima atingida em uma corrida, eles marcam velocidades médias, alem disso a estatística de 34,7 km/h de gareth bale foi dita pelo próprio sita da fifa.com em 2013, então é impossível ele ter conseguido atingir 34,7 km/h na copa del rey já que ela só foi acontecer em 2014. Alem desse fato, gareth bale atingiu 34,7 km/h de velocidade média, você não pode misturar dados de velocidade média com velocidade máxima. Ei vocês não podem fazer isso!! vocês pegaram as verdadeiras estatísticas da FIFA que eram velocidade médias e começaram e colocar velocidades máximas. Hey you guys can not do that !! You got the real FIFA statistics that were average speed and started and set maximum speeds. how……is salah nowhere on this list?? ?